Before I start rambling about everything pregnancy and baby related for this bumpdate, I first have to talk about this outfit! 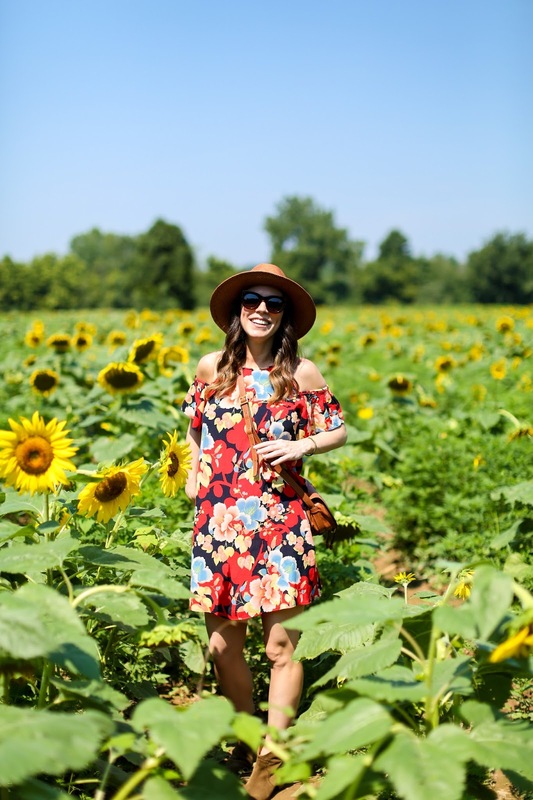 I swear Loft is saving me through my pregnancy because their petite style dresses fit me so well (remember this post and this post) and there are so many great styles that seem to flatter my stomach as it grows. 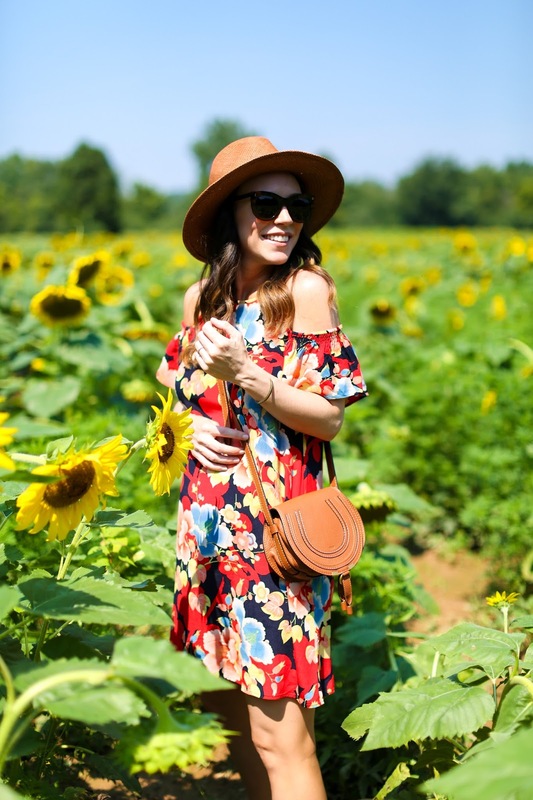 While they do have maternity styles to choose from, I have been gravitating towards their regular clothing and find it works just as well. And every single piece I have purchased will still work next year so I don't feel like it's a waste of money. 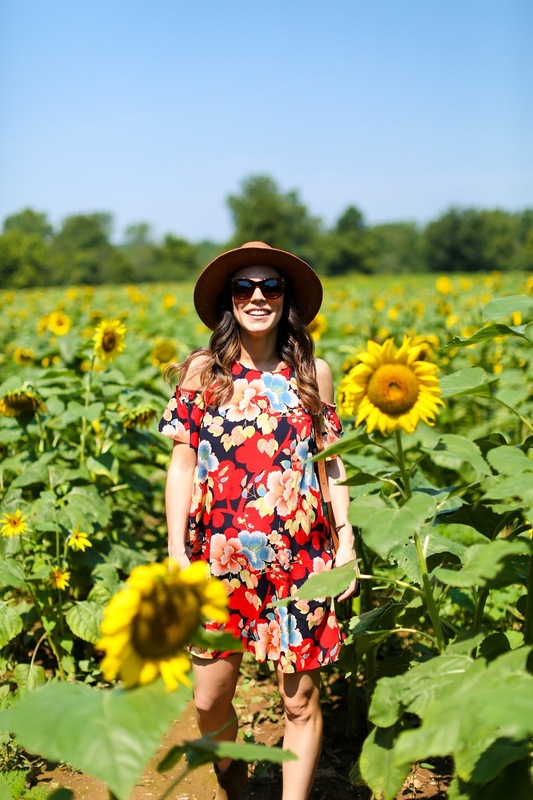 Stan and I shot these pictures at sunflower fields near our home that I had been dying to visit all summer. Sadly we arrived about a week too late so everything was beginning to wilt, but it was nonetheless still beautiful. 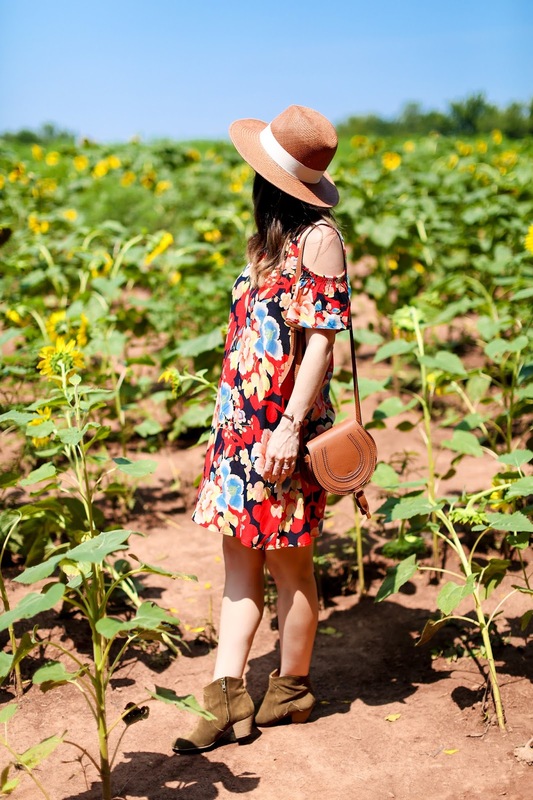 I didn't even want to attempt walking around in sandals or anything open-toed so I pulled out my trusty ankle boots (last worn here, here and here) and love how they worked with this dress. Wearing them actually got me quite excited for fall. 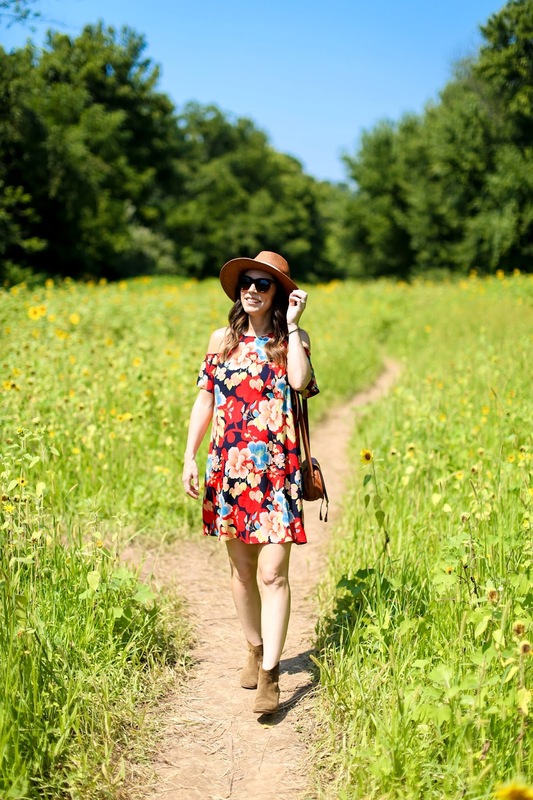 One of my favorite ways to begin transitioning my outfits from summer to fall is by adding ankle boots to regular summer outfits. I love them with shorts, dresses, skirts - basically anything. While I'm not rushing for summer to end, it's going to transition regardless so I'm trying to embrace it in a fun way. And no better way that with fashion, right?! :) Ok, now I'll move on to my official bumpdate. Read on for all my thoughts from these past months. I'm a few days away from my 3rd trimester (this is blowing my mind), and it's only been in the past 2 weeks that things have begun to get challenging again. My second trimester was very easy as I heard it can be. My hormones began to stabilize, I got back all my energy that was missing during the first few months and I felt great most days. However, I still have some symptoms hanging around like leg cramps while sleeping which can be excruiating, dry skin that can sometimes be itchy, super sensitive gums (my dentist warned me about this) and on especially hot days my lower legs and calf muscles swell a ton. Even though my 2nd trimester has been quite uneventful, over the past 2 weeks I have noticed a drastic change in how I feel. I had severe and very challenging mood swings during my 1st trimester and those have returned recently. It can be so hard to manage because while I know why I am feeling anxious, overwhelmed, sad, impatient - it's still frustrating because it's out of my control. I have gotten better at noticing the first signs of a mood swing and actually will communicate to those around me that I may be a bit more emotional than usual. All of that great energy I had during the last few months came to a screeching halt these past 2 weeks and I feel super tired and lethargic often. And as my bump grows, sitting down, working out, eating, driving and just generally moving around is getting more cumbersome. Sleeping is different every evening with some nights being restful, and others impossible to sleep because he kicks me all night long, I feel like I can't move/breathe and no position I get into is comfortable. But we are in the home stretch so I try to be patient with myself as much as possible knowing again that these issues aren't forever. Because my skin has completely flipped the script on me and gotten so dry, it has really thrown me for a loop. I have had combination/oily skin my entire life so not seeing a midday shine on my forehead startles me sometimes. Ha! Skincare wise, I have tried to add more oils into my routine while coupling it with drinking as much water as possible and trying to consume tons of healthy fats. I even added an additional omega 3 supplement to my diet and have noticed quite a positive difference. No stretch marks on the horizon yet, and I'm trying to moisturize every night with various body oils and creams to help combat them. I have some hyperpigmentation on my face that has popped up and my chest has a ton of broken capillaries on it now. :( I heard those could possibly go away after I give birth, so fingers crossed that they do. I'm still trucking along with regular clothing for now, and the only maternity pieces I have purchased are jeans. I alternate between body conscious pieces and flowy pieces depending on my mood and enjoy wearing both. I always get asked about shoes and how I am able to still wear heels and the truth is that sometimes flats can hurt my back even more. I have found that a 2-3 inch heel is often the most comfortable for me, so as long as my shoes still fit I will wear the heels! 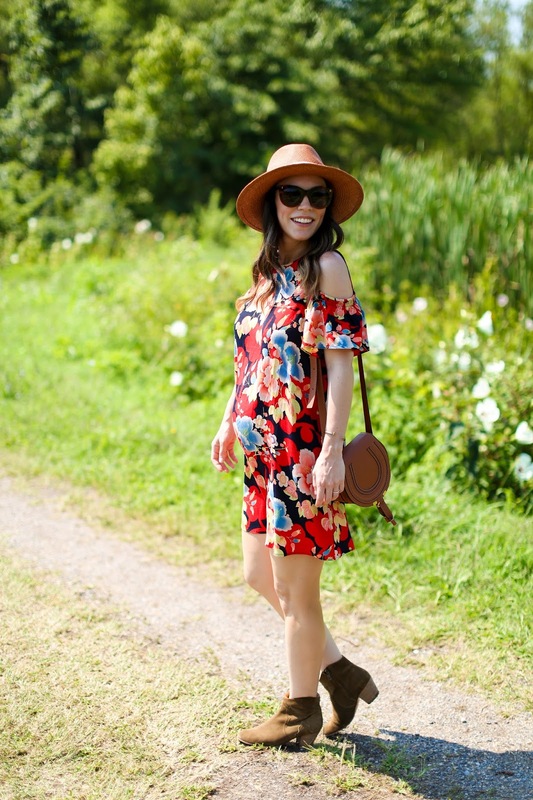 I've talked before about my love of Loft for much of my pregnancy, as well as Old Navy and GAP for many of the dresses I've worn this summer. These leggings from Lululemon are as good as everyone says and truly one of the most comfortable pieces in my entire closet right now. There are some other comfy pieces both for working out and everyday activities that I have mentioned over the past few months so, click here to reference all my maternity blog posts. Stan and I are heading to NYC for our baby shower in a few weeks, but a few things from the registry have already begun to trickle in. Of course, I couldn't leave this off the registry and was so excited that someone sent me one already. I heard wonderful things about this Nose Frida set which was also a registry item we have already received. Dockatot sent us one of their baby docking sleeper stations and I think it will come in handy immediately. Additionally, I had so many friends and family rave about it which was a huge bonus. This chair from 4Moms just arrived the other day and I was laughing so hard because Stan could barely contain his excitement in putting it together. He has already assembled it, synced it to his iPhone and practices using it on the all the various settings. Funny enough, that chair was one of the first things a co-worker at Stan's job recommended to him when he found out we were pregnant. He said it was a lifesaver for their newborn so Stan and I have our fingers crossed we have as much luck! As far as nursery decor goes, I am still thinking about how I want the room to look but have some ideas that I will be sharing in a post tomorrow! I ordered the crib and the dresser so I am slowly making progress. Emphasis on slowly. Eek! My friend that is helping me design my office will also be working on the nursery so I don't feel completely lost. She has amazing taste (and three kids!) so I know I am in good hands. Thanks to everyone for all your kind words and well wishes over the past few months. Pregnancy is already a highly emotional and difficult time, and I was actually quite nervous about sharing it publicly. However, since writing and running a blog is my job I knew it came with the territory. I am so grateful to have received nothing but kind and uplifting support which means the world to me. This blog is still primarily a fashion and beauty blog so I have tried to keep that the primary focus and will continue to do so after he arrives. Any baby/pregnancy/maternity posts will be peppered in here and there for those interested, but won't take over. LOL A little over 3 months to go!! Yay!